Virendra Tarkhad gives a good detail about the proof of Baba's Mahanivrvana they witnessed in Mumbai . Please read the story below. Moreshwar Pradhan was a close devotees of Sai Baba. He was a judge in Bombay High court. He was suffering from acute Asthama. He used to be a partner of my grandfather whenever they used to play the Bridge (a game of cards). For the cure of his Asthama my grandfather advised him to visit Shirdi and he obliged. On his very first visit to Shirdi when he met Sai Baba he was offered to inhale the 'Chilim' (a clay pipe which Baba used to smoke) which Baba gave him personally. Moreshwar was rather worried but he inhaled the 'Chilim' and it was a miracle. From that moment onwards he never got any attack of Asthama. What a strange way of curing a person of his ailment. Moreshwar thanked my grandfather and from then on became an ardent devotee of Shri Sai Baba. It was a Vijayadashmi day of the year 1918, and late afternoon suddenly Moreshwar got an attack of Asthama. The attack was severe and he had send his servant to Bandra and requested my grandfather to come to Santacruz to his residence. Moreshwar's servant told my grandfather that his master has suddenly taken ill and requested him to rush for his help. Then my grandfather along with my father left their house. Offcourse they carried along with them the 'Udi', which Baba had given personally to them on their last visit to Shirdi. They saw Moreshwar in utter distress. My grandfather consoled him. He put Baba's 'Udi' in a glass of water and requested Moreshwar to drink the same. Moreshwar obeyed my grandfather as he was reckoning him to be his very close friend. No sooner had he drank the water than the intensity of the attack went on reducing and in a short while he was feeling relieved. Moreshwar asked my grandfather stating that Baba had said that his Asthama has gone for ever in which case how come the revival of the attack? My grandfather advised him not to worry and in the event it happens again he should consume Baba's Udi as medicine. However Moreshwar was not required to do so any more. The consumption of Udi had certainly reduced the Asthama attack but there was an altogether different kind of message behind this incident, which they all realized later on. 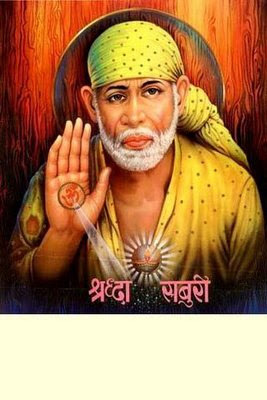 On that very day at about 2 p.m. Sai Baba had taken Samadhi in Shirdi and while doing so he had sent in his typical way wireless messages to all his ardent devotees. Of course my grandfather and father had also received this wireless message . But then something very interesting happened. On returning from Mr. Moreshwar's residence to their home in Bandra when they went in front of their Sandalwood Mandir to offer their thanks to Baba, they found that Baba's portrait had slipped out from the bracket, and it was hanging in an inclined position. They inquired with my grandmother whether any servant had performed any cleaning operation in their absence. But it was not possible as that was the Vijayadashmi day and all cleaning and pooja had taken place in the morning. They were then trying to figure out the coincidence of those two events. They thought of going to residence of Mr. Tendulkar or Mr. Dabholkar who were residing nearby in Bandra. But this was not required as the servant of Mr. Dixit from Vile Parle was at their doorstep in the evening. He informed them that Baba had passed away in the afternoon in Shirdi and Mr.Dixit would be leaving for Shirdi and had requested Babasaheb Tarkhad (my grandfather) to join him. On learning this they were able to put two and two together and realized that Baba had send them the wireless massage indicating that he is going for his Mahanirvana and bidding good-bye to this world. So was the temporary revival of Asthama and sliding of Baba's portrait in the Sandalwood Mandir. Imagine the distance between Shirdi and Mumbai and what a unique way to communicate with his loving devotees that one is bidding good-bye forever.. Dear Sai devotees very appropriately Baba is termed as "ANANTAKOTI BRAMHANDANAYAKA RAJADHIRAJ YOGIRAJ PARABRHAMA SATCHIDANANDA SHRI SAINATH" and such unique ways of his communications to his loving devotees must be sending shivers through their spine which they only know better. Of course Sai Baba's Mahanirvana was only his bodily departure because during his "Avatarkarya "he had impressed upon the minds of his devotees that he will always be there with them and at their beck and call. He had declared that "My bones will talk to you from my grave and keep immense faith in me. The eternal truth is I am always alive and this is my promise to you all, which you should never forget. 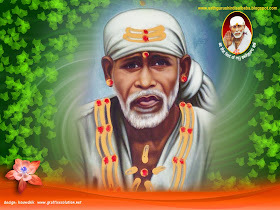 "(NITYA ME JEEVANTA JANA HECHI SATYA)"
sai ram my heart&mind has no words to express my feelings.BABA,S DIFFERENT LEELAS TOLD IN YOUR BLOG REALLY TOUCHED THE HEART.SAI BLESS ALL.